A Pentaformaic Planetary Warp (on the psychic plane of course), to conclude the 4 Points and focus the 5th Point of AETHYR to conceive the vision of the future some 364 years from 2012 at the dawn of the Age of Aquarius. 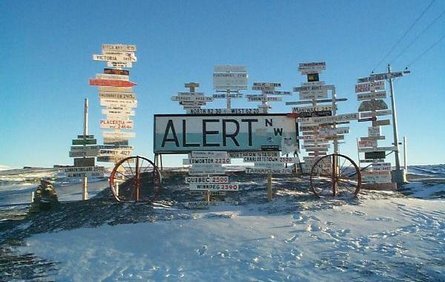 After a successfully documented and magically transformative journey* completing the ‘silver circle’ around the world, the AM47 ship is to again set sail north from San Francisco no later than 02 Oct 2012/13, etc., for Alert, Nunavut, the northernmost inhabited place on the planet near the North Pole. The space above the North Pole is the AM47 Point of Elemental AETHYR (PoEAE), and reaching Alert will begin the completion of The Pentaform: A Psycho-Cosmic Pyramid Crowning Gaia. The Pentaform is created by generating psychic energy from the experiences and Synchronicity made by traveling to each of the 4 AM47 Elemental Points and finally reaching the 5th Point of AETHYR. When our Earth and Sun align with the end of sidereal Virgo and the beginning of sidereal Libra on 17 Oct 2013/14, etc., this planet/our reality have the chance to ‘enter’ the PoEAE. The crew of Project AM47 and ‘livestreaming’ participants from around the world will then attempt to generate, observe, dedicate and send the Awareness created by the completed Pentaform through the PoEAE. Once our Awareness pervades AETHYR, we’ll have the opportunity to receive a transcendent emanation through The Gateway of Arcturus which contains the vision of the future perfect version of Planet Earth in the Age of Aquarius. The Awareness of this Emanation will spread all over the world and open the hearts and minds of all beings to work together to attain that future, some 364 years from 2012. The 5 Platonic Solids are timeless symbols of creation as apprehended and manipulated by the human imagination. 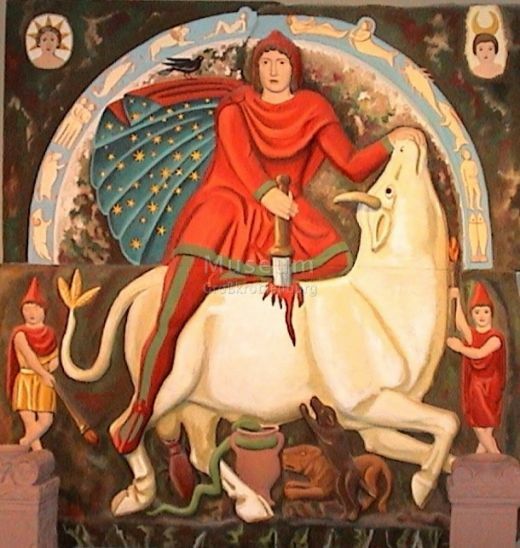 Mithras, the Magician out-of-time ushering in the Age of Aries. Gerardus Mercator’s “fortune making” map of the mythic North Pole. This book holds Great relevance to AM47. 9. (2001) The North Pole Inner-Earth Expedition was a kind-of sister expedition to AM47: A voyage to the North Pole to look for an entrance to the “Hollow Earth”. Their project is now defunct because it’s a bit too nutty, even for me. 10. (07 JUL 2007) AM47 discovers that the North Pole is the Point of Alchemical AETHYR! 11. (01 AUG 2007) Russia made the first real claim to the North Pole on 01 AUG 2007 by placing a metal flag on the seabed at the North Pole. But I discovered that the North Pole was the AM47 Point of Alchemical AETHYR on 07 July 2007! That means that I beat them to the claim by 3 weeks… damn I’m good. And people think I’m un-American… eat that haters! 12. (12 Mar 2008) The “global superpowers” race for energy supremacy at the North Pole… But shouldn’t it be the one place that belongs to Everyone?? 13. (10 Aug 2010) Laurie Anderson gives a thumbs-up (to the Nuclear-Free Future Award ), and speaks about the process of imagining the end of the world and the steps needed in order to prevent it… while at the (magnetic) North Pole. 14. (18 Oct 2011) The group M83’s music hit “Midnight City”… M83 is a spiral galaxy just below the Point of AETHYR!!! 15. (05 May 2012) NPIEE gets the greenlight! (26 JAN 2014 UPDATE: as previously stated, NPIEE is now defunct. But still, they did lay a lot of groundwork for a mystical-style voyage to the North Pole that may yet still prove to be of some value). A major documentary film producer has agreed to fund their “Inner Earth/Hollow Earth” expedition! The charter deposit is about to be submitted to the Russian charter company. After six years of hard work and faithful support, the Expedition is ready to depart in July-August of 2013. This gives me a glimmer of hope that one day AM47 will get funded as well! Though AM47’s premise is more nebulous, the evidence is evermore compelling nonetheless! It just hit me that NPIEE is going Below, and AM47 is going Above! As Above, So Below~As Without, So Within. AM47 and NPIEE truly are sibling projects… We need to borrow their ship to make it to the Point of AETHYR. NPIEE’s proposed course up to the North Pole… can AM47 borrow their Icebreaker please. 16. (17 May 2012) Nasa’s Wide Field Infrared Survey Explorer has sampled 107 ‘potentially hazardous’ asteroids near Earth – 330ft wide or larger – to make estimates about how many are out there – and the figure is a terrifying 47,000. 47,000 asteroids ready and willing to punish the MonkeI. 18. (20 May 2012) “Torsion Fields (albeit still pseudoscience at this point)” are an intriguing “AEthyric” mechanism by which (sidereal) Astrology may operate to influence persons, places and things in general. On Sunday, May 20, 2012, the first annular solar eclipse visible in the continental United States for 18 years crossed the entire Pacific Ocean. Richard C. Hoagland performed a very interesting experiment during the eclipse that I would like to see replicated again please… Inconclusive yes, yet something in this does resonate… needs work. 19. (11 Sep 2012) AETHYR is the structure of creation.?. The Higgs-Boson particle/field as a torsion back into AEthyr? The Higgs-Boson “God Particle” was theorized 47 years ago, and found today, 11 Sep 2012 ;) …needs work. Is this the ultimate shape of our universe? 20. (12 Sep 2012) The Aurora Borealis as seen near Alert, Nunavut, Canada. Aurora Borealis near Alert, Nunavut. The shrinking Ice-sheet at the North Pole. 24. (17 Oct 2012) The Sidereal Astrological chart at/on the 2012 AM47 Point of Elemental AETHYR: No greater cruelty than the dream withdrawn. Saturn, the grand malefic, has been applying to the Point of AETHYR (@ Zero degrees Sidereal Libra) these past few years… No wonder that project AM47, even at this critical time, could Never have been made a reality. This year would be the first real chance AM47 really ever had, with Saturn finally being just out of the orb of influence to the AM47 Point of AETHYR… Why… Was it always too late.?. Saturn has been sitting on the Point of AEthyr the past few years… This year would be the first real chance AM47 really ever had… Was it always too late.?. 25. (17 Oct 2012) No greater cruelty than the dream withdrawn.?. Tell me you’ll help me fly. 26. (17 Oct 2012) AETHYR : 2014 and The Ultimate Porpose of AM47. 27. (24 Jul 2013) How the shrinking Arctic Sea Ice at the North Pole will make The Alchemy of Project AM47 possible. 28. The Olympic Torch touched the North Pole ON THE POINT OF AETHYR DAY!!! that’s just wild wild. And from there is was taken to the Space Station and actually out into outer space.